After a long work week Husband and I often get our TGIF on by sampling a new to us craft beer or wine – because drinking local is green, right? Well, that and it gives me empty bottles to use in DIY projects. The most difficult part of a wine bottle DIY project is cutting the bottle. The cutting a bottle by lighting string on fire method doesn't work for me. I can’t get a clean break. I also am afraid I’m going to burn down my house starting with my workspace in the backyard because it involves holding a bottle wrapped in string you've set on fire. Yikes! 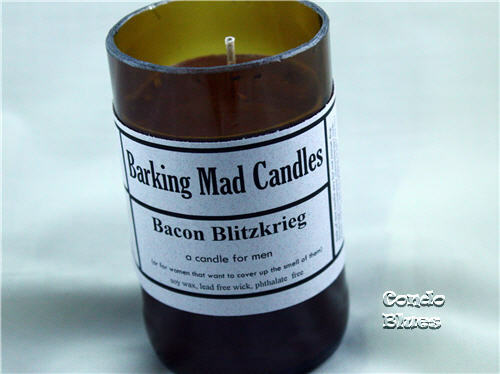 Learn more about my beer bottle bacon candles here. By the way, I bought my kit with my own moo la la. The soon to be empty bottles too. and the Generation Green (g2) Bottle Cutter - a variation of the Armour kit. I get the best results with the Ephrem kit which makes it my favorite. The other two kits use a scoring and tapping technique which is better at smashing the bottle than cutting it, in my opinion. little bumps when you sand the sharp edges on the bottle. 1. Have extra practice bottles on hand and cut a few of them first. If I haven’t cut a glass bottle in a while my first few bottles sometimes have a broken edge. Sometimes I can save them with extra sanding and sometimes not. So it never hurts to cut a few practice bottles because cutting your only fancy/unique bottle you want to use for your wine bottle project. This is why you will see a series of bottles in this post. 2. Some types of bottle are thinner or thicker than others and will need a little extra finesse. For example, Wine bottles are usually thicker than beer and soda bottles. See above. Bottle thickness can also vary with brands. Notice how thick this bottle is? It is from a mimosa. Compare it to the thin Trader Joe's wine bottle below. 3. The best way to ensure a clean (or cleaner, because cutting bottles is not an exact science) cut is to score the bottle first. This is where the bottle cutter kit is your best friend. There are cheaper ways to score a glass bottle before cutting it but they are also difficult to make sure you have an even and level cut line. 4. 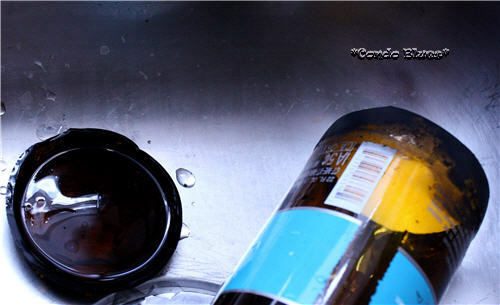 Remove the label from the bottle before scoring or score the bottle above or below the label. If you keep the label one you will end up scoring paper and not the glass underneath. You need a solid score line around the glass bottle for it to break. Trust me on this one. Soak the label off in the hottest water possible first. 5. 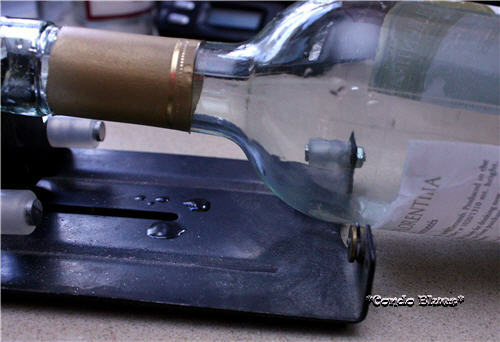 Lightly and evenly score the bottle using the bottle cutter using one rotation only. I always get a better cut from a light scoreline the bottle than when I smash the bottle into the cutting wheel to make a deep score line. I learned the hard way, don't be me. 6. If you have little gaps in your scoreline, it may lead to a chunky cut. 7. If you go over the scoreline more than once, it may lead to a chunky or useless cut. 8. The secret and trickiest part of cutting a glass bottle is getting the glass bottle hotter than you think you should followed by getting it colder than you think it is to cause the bottle to break along the score line and cut the glass bottle using science! 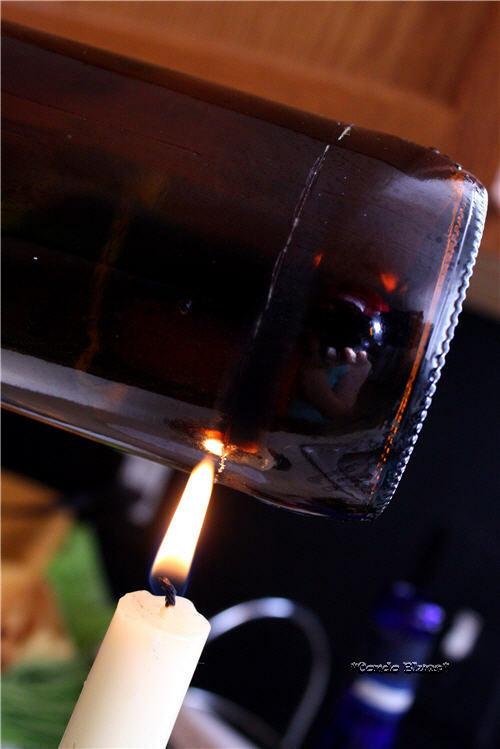 To get the bottle hot enough, I rotate my glass bottles in a candle flame to heat the bottle instead of over the flame. This is the part that is the easiest to mess up especially if you impatient like I am. There is the perfect storm of turning the bottle in the candle flame enough times and at the correct not too fast not too slow speed to get the bottle super-hot and ready to crack along to score line when you immediately chill it. You will just have to play with it until you figure out what works best for you. That’s way it is a great idea to cut a few test bottles first. Plunging the hot bottle into cold tap water isn’t always cold enough to trigger the reaction that cuts the bottle but ice water will. 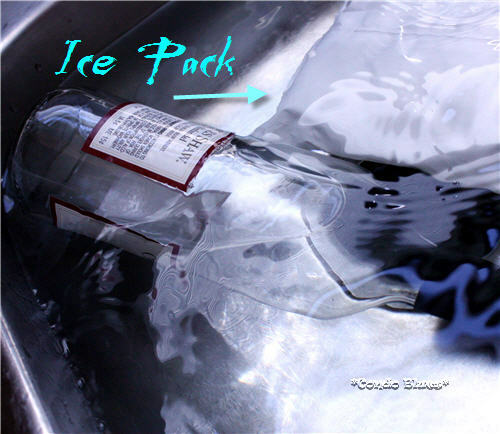 To ensure maximum coldness, I add our big reusable picnic cooler ice packs to the water – the more the better. If I have ice cubes I add them into too but the big chunks of ice do the heavy lifting. I cut the bottle above the label. The bottle popped apart in my hand after plunging it into the ice cold water. 9. If the bottle doesn’t break apart along the score line after heating and cooling it, chances are it wasn’t hot or cold enough or both to trigger the cutting reaction. Dry the bottle off and heat the bottle longer and do not wait to plunge it into the icy cold water. When you hear the glass cracking, you know you have it on the magic scenario to cut the glass bottle. 10. 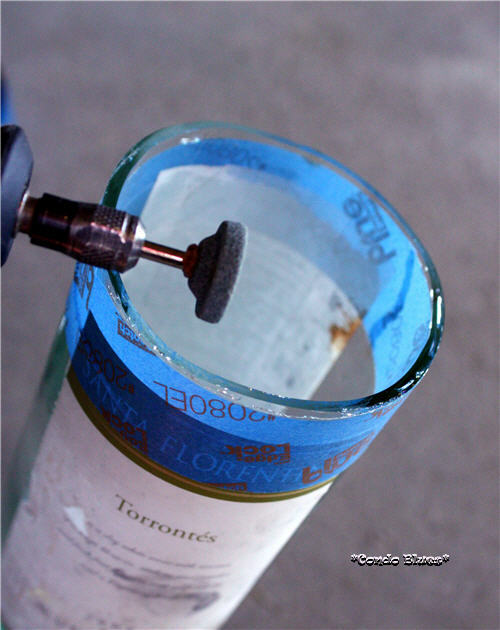 To even out a wonky cut, wrap the bottle in painter's tape and use it as a guide to sanding the edges even. 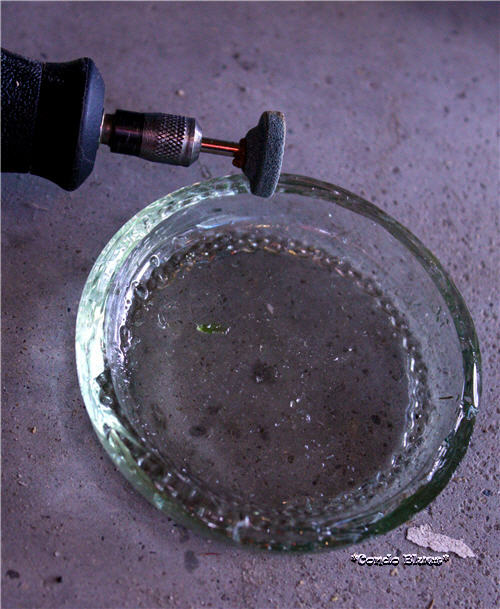 when wearing safety glassing and dust mask, I use a rotary tool and glass polishing bit (the green stone bit) to polish the sharp edges of glass bottle until it is no longer sharp. Warning: Breathing glass dust can cause serious health issues, please wear the recommended safety glasses and dust mask to protect your eyes and lungs, OK? Now you are ready to craft with a glass bottle! What do want to make?